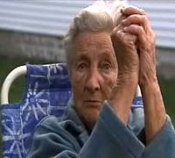 OCTOBER 20--An 88-year-old Ohio grandmother was arrested last week when she refused to return a neighborhood boy's football that had landed in her front yard. A frustrated Edna Jester took the football last Thursday evening after it landed, once again, in the yard of her Blue Ash home, where she has lived since April 1949. When Jester refused to return the football, neighbor Paul Tanis, 40, called the cops. Though police warned that she would be arrested unless she returned the football, Jester refused, according to a Blue Ash Police Department report. In a TSG interview, an emotional Jester said that she had repeatedly warned her teenage neighbors that she did not want to retrieve their football since, 'I'm not a ball chaser.' Jester, pictured at left, added that she frequently told the young football enthusiasts that she did not want them on her property and did not want to be bothered while she was reading the Bible or eating dinner. Jester, who lives alone, still has the football. The petty theft bust was the first arrest for Jester, who has been widowed for about ten years. One of Jester's three children has predeceased her, while a second, a 70-year-old daughter, is living in a nursing home.